Now it's time for part two of the headphone shootout and the over the ear models. They consist of Kingston HyperX Revolver, the Kenwood KH-KR900, Blue Lola, and Audio-Technical ATH-A1000Z. They range from $129 to $399, with $129 for the Kingston,$219 for Kenwood, $249 for Blue, and $399 for the Audio-Technica. The Kingston HyperX Revolver is actually a gaming headset, that doubles as a standard over the ear headphones. The mic is detachable. The attached cable is a standard cable. Then there is a second cable that attaches to the attached cable. This extends the cable length for sitting back from the TV, and it also has mic mute switch, to mute the mic wherever you need to have a conversation with someone else in the room. At least this is what I thought initially, which turned out not to be the case. The second cable with the built-in mic mute and volume switch is for PC gaming. For XBox One, the cable will plug in to the controller. In order to have control of the volume at your fingers, you would need an adapter that connects between the Revolver headset and the controller. The Kingston HyperX Revolver came shipped in a nice looking box and cut out insert to protect the Revolver. Included in the box was the owners manual, detachable mic, second cable with the mic switch, and the headset. Materials used in the construction were good, and the quality of construction and the fit and finish was even better! These looked like they should have been priced more. And they were very well made, which is a good thing based on the amount of time gamers tend to, well.....game! But, how do they sound? David Bowie: Let's Dance, had nice depth, impact and authority in the kick drum. The knocker sounded woody and revealed a wide soundstage and good imaging. Vocals were natural, percussion was crisp and dynamic. Journey: Don't Stop Believing, keyboard sounded natural, vocals were very natural with great texture and detail, the size of soundstage surprised me, throwing a large and wide soundstage! Percussion had good dynamics, kick drum had good depth. Also Sprach Zerathustra, very good low end extension as well as output. Brass was smooth and not overly brassy. Nice impact in the tympani, with nice big soundstage. Junior Wells: Why Are People Like That, really nice low end extension in the bass that also played with authority. Vocals were very natural with good texture. The harmonica was nice and clean with good dynamics. Gershwin: Rhapsody In Blue, clarinet was really natural sounding with enough resolution that you could hear their breathing technique. Brass sounded smooth, piano sounded natural, and bassoon had nice depth and texture. They threw a big soundstage, and imaging was good. Kenwood is fairly new to the headphone industry. They have a couple different models. What they included in the shootout is their top of the line KH-KR900, that has a MSRP of $219. Kenwood has made excellent car stereo components for decades. Having a lot of experience with their quality car audio gear, we naturally jumped at the opportunity to include this model in our Headphone Shootout. The Kenwood came in a nice looking printed box with photos of the product and it's specs I like the fact that it also had a clear plastic window on one side so you can see the actual product. And they were well protected, held in a custom molded plastic insert. Materials used were mostly plastic, with some metal. Quality of materials used were very good, as was the fit and finish. They were also fairly light weight, which would be nice for long listening periods. I also liked the design of the Kenwood KH-KR900. The sides of the earcups swivel, which is popular DJ feature. This allows you to hear the music, as well as those around you. At a price of over $200, they can be considered by some as an investment. The use of detachable cables I feel is a huge selling point, that way if you get a short in the cable, all you are replacing is the cable. The styling of the outside of the earcups reminded me of the styling of some of their car amps. The real question though is if they sound as well. David Bowie: Let's Dance, keyboard sounded natural, vocals sounded natural with good timbre and texture, soundstage was big, kick drum had good depth and output. Journey: Don't Stop Believing, keyboard sounded natural, vocals were natural with nice texture and harmonics. Percussion had very good dynamics, kick drum had very good depth and played with authority. Also Sprach Zerathustra, had really nice ultra deep base with really good output. Brass was smooth with good resolution and a big soundstage. Tympani had nice dynamics and impact. Junior Wells:Why Are People Like That, showed nice deep bass with good output and authority. The vocals were smooth with really nice timbre and texture. The harmonica had nice dynamics with crisp harmonics and good resolution. Gershwin: Rhapsody In Blue, clarinet was very natural and smooth with very good resolution to hear the breathing technique. Brass was smooth, clean and not too brassy. The bassoon had nice texture and depth. Piano was very natural sounding, with great dynamics. They throw a big soundstage. Next up is the Blue Lola. Last year Blue came out with the Mo-Fi. They were a big hit among audiophiles, especially with the built in amp. Now, Blue is expanding their line up with the Lola. The Blue Lola has all of the unique features of the Blue Mo-Fi, only with no headphone amp built in, and lack of headband tension adjustment. The lack of these feature has resulted in a price drop from $349 to only $249. On paper, this is an extremely aggressive price point given the features. We'll see how they actually perform. The Blue Lola came in a great looking box, with photos of the product and it's specs. The materials used in the construction was actually mostly metal, with some plastic. Quality of materials used was very good, and the fit and finish was excellent! The Blue Lola is a premier product, and built like a tank! Also included in with the Blue Lola is the owners manual, soft carry bag, and longer cable. I love the design of the Blue Lola. Starting with the Blue Mo-Fi, they started from the ground up in designing a headphone. And the design, especially the headband, was totally out of the box thinking. It allows you to not just adjust the fit, but also the tension. All of this is done by incorporating a lot of metal arms and joints. This makes it not only well adjustable, but very sturdy in build, so it should be able to last a very long time. The Blue Mo-Fi performed so well last year, I was excited to see how the Lola would sound. David Bowie: Let's Dance, kick drum had very good depth and had good output. Knockers showed a huge soundstage, percussion was crisp with really good resolution, vocals were natural with great texture. Journey: Don't Stop Believing, keyboard sounded extremely natural and detailed, vocals were silky smooth with excellent texture and harmonics. The soundstage was really big, and imaging was spot on. Also Sprach Zerathustra, really nice clean ultra deep bass, with very good authority. Silky smooth brass with nice detail without being too brass, and throws a big soundstage. Tympani had nice impact. Junior Wells: Why Are People Like That, bass had really good depth and authority. Vocals were silky smooth with excellent resolution and timbre. Harmonica was smooth, really clean, and very dynamic. Percussion was crisp with good resolution. Gershwin: Rhapsody In Blue, clarinet was very clean and smooth with good texture and woodiness from the reed. Brass was also smooth without being too brassy. Piano sounded very natural. Bassoon had excellent depth and air. Imaging was excellent as was the soundstage big. Last but not least is the Audio-Technica ATH-A1000Z. Audio-Technica is known for providing excellent quality headphone, for a big bang for the buck. With the increase in popularity of the newer Hi-res audio format, it was time for an update. Audio-Technica is starting to redo their lineup with new Hi-res audio compatible models. Up for review today is one of those new models, the ATH-A1000Z. The Audio-Technica ATH-A1000Z came in a great looking glossy colored box with photos of the product and it's specs. Materials used in the construction is mostly metal, with some plastic. The quality of materials used was very good, as was the fit and finish. The ATH-A1000Z is a premium product, as you can tell. It can be seen in the metal earcup backs, in the thick cable, and even the metal connectors on the end. Also included in the box was the manual, and a 1/4 " adapter. So far so good, but just how good do they sound? David Bowie: Let's Dance, Kick drum had very good depth and played with good authority. Percussion was very crisp, clean dynamic. Knockers had detail and woodiness, and revealed a huge soundstage. Vocals were extremely natural with great timbre. Journey: Don't Stop Believing, keyboard was extremely natural with really good resolution. Vocals were palpable in resolution and very natural with great harmonics. Percussion was crisp and dynamic with nice depth in the kick drum. Soundstage was huge. Also Sprach Zerathustra, nice really deep bass that could be heard, brass was smooth and really crisp and clean with excellent harmonics and no audible coloration, throwing a wide soundstage. Tympani had really good impact with resolution to hear the pad being pounded. Junior Wells: Why Are People Like That, bass had nice low end extension with good output. Vocals were lifelike in detail and resolution, and had plenty of texture. Harmonica was extremely dynamic with excellent harmonics. Gershwin: Rhapsody In Blue, clarinet was extremely natural with so much resolution you could fairly easily hear things like the breathing technique, it's woodiness, and the nice air from the clarinet. Brass was crisp, clean, with nice detail. Piano was also extremely natural, with excellent resolution to be able to hear the striking of the keys. Imaging was very accurate and the low level harmonics as well as dynamics were striking. We had some excellent contenders in the over the ear models this year. And the competition was pretty fierce! For a gaming headset, the Kingston HyperX Revolver was a complete redesign for Kingston to have studio grade sound. And they hit it out of the park! I was not expecting the sound to be this good at their price point. They did everything very well, and sound like a significantly higher priced headphone. Kenwood showed just how strong their audio roots are in their excellent product of the KH-KR900. Overall they had very good bass output and authority, yet were not lacking in the detailed mids and clean highs. Blue took things to a higher level with their Lola. The soft earpads fully engulfed the ears, providing a great seal, allowing all of their resolution to come out in spades. And the all metal headband was built like a tank! I did notice that the drivers did seem to be more power hungry, as the volume was noticeably lower than the other models when listening to the same track. If you like your music really loud, they would benefit from a portable headphone amp if listening to them on the go. I like my music a bit on the loud side. When listening to them thru my iPod, they were plenty loud enough for me, but I also had the volume up all the way. Last but not least are the Audio-Technica ATH-A1000Z. Audio-Technica has an excellent product on their hands! I could tell that it was a redesign for the new Hi Res Audio, as the resolution was stellar all around. Highs were crisp and clean, and mids were smooth. While the bass output was a bit shy of the output I tend to like, the bass did play low and deep with sufficient authority. 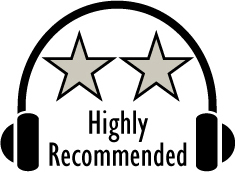 Based on their design, features, quality, and performance, the Kingston HyperX Revolver and Kenwood KH-KR900 have earned our Highly Recommended Award. 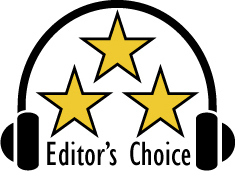 The Blue Lola and Audio-Technica ATH-A1000Z have earned our Editor's Choice Award. For more info and complete specs, check out their website at www.kingston.com, www.kenwood.com, www.blue-headphones.com, and www.audio-technica.com.